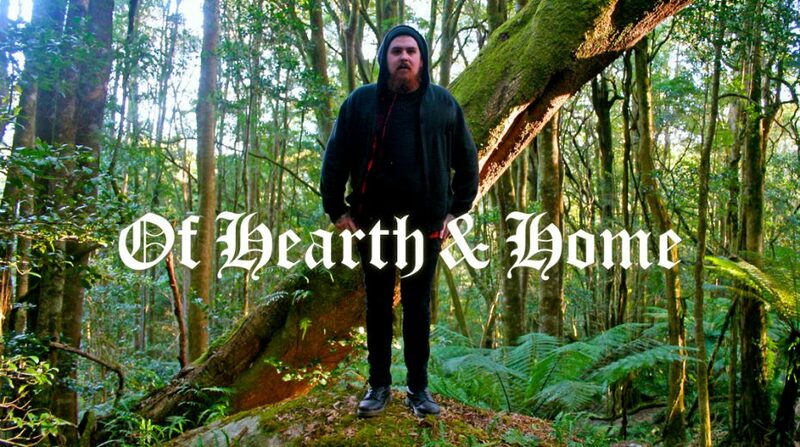 The first tones of Of Hearth & Homes debut already put a spell on me… in combination with the specific artwork I got a homelike and archaic feeling, as Robert describes it during our conversation. The solo album was released at the end of October in 2017 through the small American label Glass Throat Recordings and I am happy to share this wonderful project for our English readers on our website! Hello Robert, thank you so much for taking some time to answer my questions regarding the very new project Of Hearth & Home. After discovering the teaser on Chet’s Glass Throat Recordings, I thought it would be exciting to get some more information about your debut album. I’ve to admit that I’ve been listening to my digital promo a dozen times. You are most welcome and I am glad to hear you are enjoying my album! Maybe you can tell us a few lines about yourself first? For me it seems like Of Hearth & Home appeared out of nothing. What does the band name mean to you? Have you been making music before and how did the project come to life? I am Robert Allen and I have been making music for 20+ years. Most recently I have been involved in creating the projects Encircling Sea, where I am the vocalist, guitarist and songwriter, and Vaiya, which is another solo project of mine, but within the black metal genre. Of Hearth Home came into being in 2011 when I had a period of time to reflect on what I really wanted from life, a turning point so to speak. 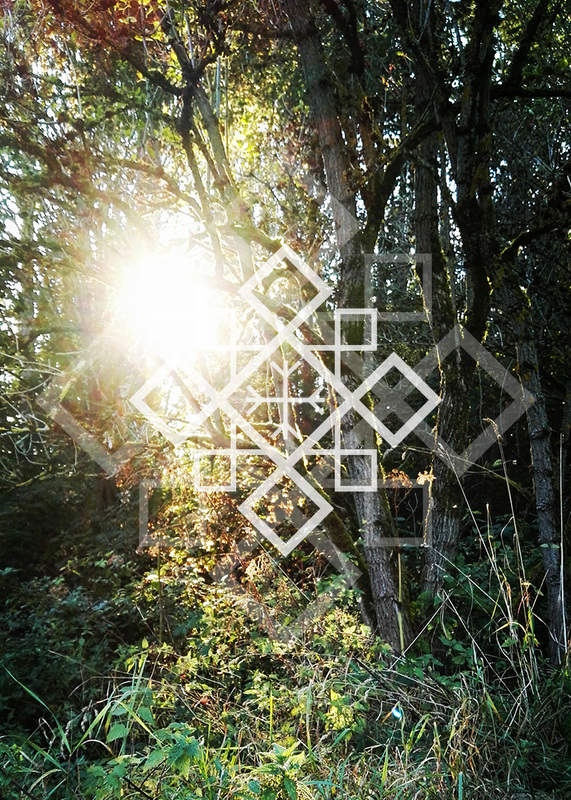 It was while I was writing the final elements of Encircling Sea’s last album „A Forgotten Land“, an album that was thematically about spiritual and physical relocation and removing myself from the city for a life in the woods. This project came to be after I completed the acoustic song on that album and I was inspired to continue writing more songs. Inspired in large part by my fellow label mates Ruhr Hunter and Fearthainne. In this time I had hours to meditate on my upcoming life changes and I spent that time playing acoustic guitar. The thematic direction was born out of a sheer hatred for city living, being utterly disconnected from nature and my family and thus, the project became a way for me to critique urban life and my life as urban dweller. This is evident in the opening track „Unhallowed Ground“. I wrote numerous songs of this persuasion but upon learning that my wife was pregnant and our lives were about to change dramatically, the theme of this project changed too. It became about the things I care deeply for. The things I consider to be my hearth and home, the foundation of my being. I know both black metal projects, but just by its name. I’ll definitely give them a try! How would you describe the musical style of your new non-black-metal-project? I think it’s not comparable to other releases from Glass Throat Recordings, isn’t it? It’s more a combination of spiritual folk (not much weird), haunting melancholic melodies and a bit of meditative structures. I don’t suppose it is similar in many ways to previous GTR releases, but it is at home with the company it keeps on this label. This music inspired me to change my life and was the soundtrack to many meditative times of deep reflection and bliss, I couldn’t think of a better label to be associated with. However, stylistically it’s a bit different, it’s probably a little more traditional in its structure. I wanted to write an acoustic folk album using only acoustic instruments and this is how it manifested. I didn’t want to write a ritual record, a neofolk or dark folk album, I just wanted to write some folk songs. I knew it would be a bit darker and more meditative than your normal folk record, but I didn’t want to limit it to one genre or feeling. Well, it absolutely fits well with the other GTR releases, though it’s not a ritual folk album. Could you also imagine using other traditional instruments such as used in Americana/bluegrass for a later album (thinking of Panopticon’s „Kentucky“) or having other guest musicians? What is your intention for the new project in future? I can honestly say that with this project, anything is possible to turn up on a recording. So while I have no plans for a bluegrass song, yet, I cannot say it won’t happen, especially, if I ever get the chance to hang with my dear (virtual) friend Austin (Panopticon) around an open fire (one day my friend!). In all seriousness though, I just plan to write songs that mean something to me, that’s it. The rest is an open book. I have some songs I’ve been working on, but it’s been such a long process getting this record to see the light of day, so I’ll just be happy with that for now. I think the cover artwork is a very distinctive one. Yet simple, but very emotional and quiet fitting to the warming sounds of the music. I think it’s a double meaning or am I wrong? Mother Earth on one hand and a human mother (which is also part in the cycle of life) on the other. Is this the reason you have chosen a female motif as a cover? This picture on the cover is of my wife a week before she gave birth to our first child. I don’t think one picture could sum up better, the meaning this record and this music has for me. It signifies the change I underwent to be ready or good enough to become a father. It shows my beautiful wife, at her most beautiful, who has been there for me, supporting and aiding me through times that have been very hard for the two of us. It shows the land that we moved out of the city for, the trees and ferns that line the creek that my family drank from and swam in. It is my life, and yes you are right, it is the cycle of life as well. As the final song on the album, „We are Nothing“, suggests, we are nothing without all of these things. We are the earth, the trees and the streams. We are our mothers, fathers, sons and daughters; we are our ancestors. We are everything before and everything to come. „We are Nothing“ could have been also a good song on Cedar Spirits. Not at least Chet himself is involved in this song and it’s the most meditative song of the album. How far did he influence you and are there other bands/things that inspire you while creating new songs? Chet inspires me immeasurably; his musical outputs are truly gifts that the gods have bestowed us. I don’t say this to be overtly dramatic, his music has truly inspired me in ways beyond the usual „oh that’s a cool bit, I might do that“. But in ways of true depth, where I have been able to, through his music, feel healed or renewed, or contemplate what it truly means to be a father and a man. Things Chet probably never intended to convey or facilitate, but things nonetheless I have experienced. So to be able to work with him as well really brings this full circle for me. Chet and I have been virtual pals for years now and, physicality notwithstanding, I consider him a true friend and a kindred spirit. Other artists, if I had to narrow it down to few, would be Fauna, Echtra, Fearthainne, :novemthree:, Steve Von Till and my good friend Adam Casey’s project, The Boy Who Spoke Clouds. Other things would, in this case, be my family, my ancestors, my surroundings, my forests and mountains and rivers. A nice constellation of bands, which are somehow very familiar with each other. It seems like they all have got the same kind of (natural) inspiration. I also love the music of Fearthainne, Fauna, :novemthree: and artists in this „corner“. Would you say this is a unique genre which was formed over the years and do you feel Of Hearth & Home is now a part of it? I believe that the music itself is a timeless reflection of the intent within. And folk music has that inherent within its name, it is determined by the individuals who play it probably more than most genres. And I think that this incarnation of a sub-genre inside folk music is determined by a group of people with an austere intent to connect deeply to the places they live and the people they call kin, the histories they call their own and to something that is timeless and true. In this modern world where connectivity is so easy but true connection is illusive, this scene of musicians are a genuine product of their environment. I am no different. But to be included with musicians I respect, admire and some cases call friends, is a great honour and I do feel part of it because of the intent in the music. We are all striving for a very similar, primal thing, and through that craving we connect to each other intrinsically. Yes, you’re absolutely right and for me this kind of music (and of course the roots of black metal) has got something very strong inside. Maybe it’s the fact that the music connects with its surroundings or landscape of each artist. It mostly says something meaningful, which you can’t find very often nowadays. Would you agree? And how did you discover those bands and the connectivity to nature for yourself? Yeah I agree, I think it is deeper than that however. I think that black metal and folk are only the vessel in which these things are explored. But ultimately the process of a grander connection with nature is a symptom of a sick society in a dying age. A society in which we are removed not only from nature, but from our own nature as humans, our connection to a place and its people, our ancestors and their ways. This is the greater meaning behind these musical explorations of nature worship, in my opinion. As we are the fringe dwellers of society, we are the first to realise the way away from the decay, the first to awaken from within the spirit of the Golden Age. I think that folk music in general evokes that primal inner being, that timeless spirit within us. Much like the primitive joy of a campfire, folk music is the soothing comfort of thousands of years of lineage before us; it gives us access to the deeper memory within our bodies, our collective unconscious, as C. G. Jung would say. As for my connection to it, I came here almost guided by spirits. I feel very strongly that my musical journey is a spiritual one toward the truth of life, my life, the soul of my being and the soul more importantly, of my ancestors. I don’t really know how else to describe how I „found“ this music and my connection to nature. It was more like it was awakened within me, dormant for years until my life’s journey decided I needed to truly understand who I am and where it is I come from. What do you feel when you’re out in the woods or mountains, do you like to go there? Is it some kind of escapism for you (which I can subtly hear in your songs) or rather being connected with the spirits of nature or just being thankful to be alive? Up until very recently my family and I lived in the woods on a large forested piece of land in the foothills of a mountain. To say I love it would be an understatement; it is a part of me. It is both home and escapism. Where we lived was my hearth and the forests were my home. Due to other family concerns we have had to move away temporarily, but our land is calling us back and we will return! I felt very connected to the rhythm of nature when I was in it everyday, now that we live in a town, I don’t as much and I have much less opportunity to spend time out in nature at the moment. Therefore I feel disassociated from that currently. But every day I am thankful to be alive, every day I thank the gods for my chance to witness nature’s beauty and understand the cycles of life not only through nature, but also through living that cycle and celebrating it. I think it’s hard sometimes, as you say because of family concerns or maybe ones job, to celebrate this cycle. It’s even harder if you’re living in the city and there’s always so much diversion by all that consume today. So, how can you manage to live in the woods? Are you some kind of self-supporter? Well as we no longer live in the woods for the time being, this answer will be a little tainted. However, while we living there and building our home, we were doing different things. My wife worked in a clothing and jewellery store a couple of days a week, I was at university studying history and also working odd jobs doing maintenance and painting sometimes. But life in the bush, as anyone who lives there can attest to, is hard as you really need to carve your own work and this is a hard thing to establish and it takes time. We weren’t really there yet but we were working on it. In the meantime we just had to travel to town to work while we established our property. It is nowhere near ready, even after 5 years, and now we are away from it. But we will return and it will progress. The Mother is calling. Sorry for you Robert. I think you both will be missing it so bad. Despite not living in the woods at the moment, will you be working on a sophomore release of Of Hearth & Home? And what can you tell us about the relation to Encircling Sea? You already said above that the acoustic track on the latest release has been decisive for the existence of the new project. I have been working on some songs yes, but not for sometime. They come in a flurry of inspiration generally, where I will write 5 or 6 songs in a week or two and then nothing for a long time. I look forward to getting into the mindset to work on some new songs but for now, I am just happy to see this released and work on some other projects. Yes the acoustic track on the Encircling Sea record was very decisive as it gave me the confidence to write more acoustic songs and most importantly, to sing, something that, for me, has never been a natural inclination, at least in this manner. New Encircling Sea music is on the very near horizon and I cannot wait to see that released as well. Most of my musical projects are related; none are alien to the other. I am involved in some things that are upcoming that are a fair bit different. But for my ain projects (Encircling Sea, Vaiya and this one), they are intimately related almost to the point of being branches of the same tree. I also have seen somewhere in the world wide web, that you have been playing some live shows in the past. Are you going to promote the project with some live shows this or next year again? Soon after I recorded the album I wanted to play live and test the project out in a live setting. I have done something like 4 or 5 shows over the last 3 years. Those shows have shown me very much what I want and particularly what I don’t want from an OH&H show. So any further shows will be considered on their ability to fit those criteria. I do plan to play some shows to support the album, maybe even tour a little with my friend Sam Haven from Brisbane. But nothing is set in motion as yet. Robert, thank you so much for the interview! All the best for your family and I really hope you’ll return soon to your forests, mountains and rivers. The last words belong to you! As do I my friend, and thank you for the opportunity and support. Be well!